Hi , how do i decrypt a massage ( the public key ) showed in the screen shot ? do i need there full name ? or email address ? or something ? to decrypt the massage ? i cant get my public or private key to work to decrypt . I must be missing something ? and i seem i cant import or export my keys ? (showed in screen shot ) it comes up with code=0 ? and the public key is NOT signed ! so dont know why i cant decrypt it . Run that on your system and see if the problem persists. Hi , how do i decrypt a massage ( the public key ) showed in the screen shot ? do i need there full name ? or email address ? or something ? to decrypt the massage ? i cant get my public or private key to work to decrypt . The public key is NOT signed for . So i don't know why i can't decrypt it .! I must be missing something ? let's continue here. Otherwise things would have gotten too complicated. Let us know if that fixes your problem. Should your issue persist, could you please provide a link to the place where you found the key you want to paste into GPG Keychain Access? 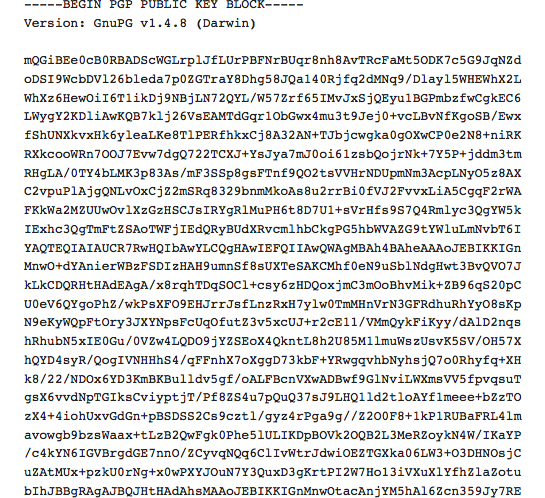 Or if it's not on the web, attach the pub key in a text file, so we can test and see if we can reproduce the problem. I'm having the same problem -- Code=0 error on importing this signing key from Torproject.org -- https://www.torproject.org/dist/torbrowser/osx/TorBrowser-2.2.37-2-.... I tried removing the .asc extension altogether and replacing it with .txt -- same result. I meant to say I tried this as well with the nightly build referenced earlier in this thread. I'm using OSX Lion 10.7.4 on a Macbook Air. Slightly different message but check to make sure you have a key server. Thanks, but I did have a keyserver set in preferences. Turned out the network I was using blocked ports. But... I still don't know how to use GPG Tools to verify the signature on a file. Is there a URL for a how-to on that? Its kind of a pain as I recall. Notice the follow up. You have to get the signatures and then you have to "trust" them. I think I eventually (a few years ago) just gave up. I haven't tried recently. Read http://support.gpgtools.org/kb/faq/how-do-i-activate-gpgservices to find out how to active GPGServices. Steve closed this discussion on 24 Aug, 2012 04:52 PM.